This motion detector light with built in digital camera and card reader is at the top of its class because it is in a class by itself. To the look at it, it appears to just be a normal motion sensing light, but it has a hidden security camera (two megapixel) built in. The wiring is as simple as any motion detector. They accomplish this by incorporating a digital card slot for SD digital camera cards. Just pull the card out and put it in your computer to view the pictures. It records video in ten second increments as well! When the card fills up, it overwrites the oldest files, so no worry about having to empty it all the time. With a couple gigabytes of memory card, you can get a lot of data. It is full color. It time and date stamps every image. This gives you not just security, but evidence. The light is a 500 watt halogen, so this thing will really light up the yard. There are some problems with this light. There is very little customer support. While the light will only be triggered at night, the camera takes pictures all day. This may be a good feature, but you have no option to disable it short of wiring it to a switch, which brings me to the next problem: when the light loses power, it loses track of time. There is an LCD screen for programming the device, but it is placed in an awkward location and upside down. The motion detector will detect things that are outside of the camera’s 52° viewing angle, which could be good considering there is a long shutter lag, but it will also give you some pictures with nothing in them. The camera does take two pictures each time it detects motion. The light can be swiveled up and down, but not side to side. There is no sensitivity switch, so end up with lots of pictures of your cat. I hate to recommend a light that has so much room for improvement, but it really is in a class by itself for the moment. If you want this functionality at this price, this is your light. 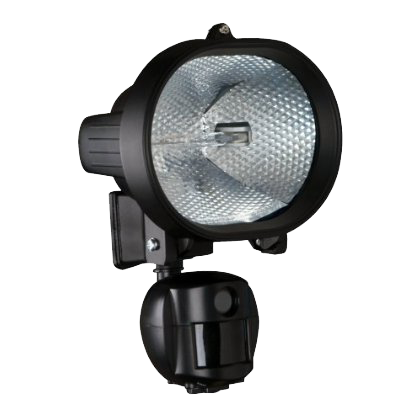 If you have a problem and the light snaps a shot of it, it has likely already payed for the additional price for the motion camera. Costco used to carry this camera, but I don’t believe they do any more. It is available through amazon. Update: I recently had a trackback from a post on West Seattle Blog. Apparently, the author came home from work on a bright rainy afternoon to find that someone had squeezed through an eight by twelve window, stabbed their alarm system with a kitchen knife, and made off with their TV, wrapped in their favorite blanket. I know how hard it can be to come home to this. It is an awful feeling that doesn’t go away for a long time. After reading this, the feature set of this light really came together for me. The camera being hidden prevents it from ending up stabbed with a kitchen knife, and the photos being taken during the day is really nice when thieves don’t wait for dark. With this hidden camera light, the story above could have ended with them pulling the card out of their light and handing photos of the perpetrators to the authorities and having their favorite blanket returned, possibly still wrapping their television. Or, alternatively, there is a very nice networkable security camera with night vision put out by Logitech, which is similarly easy to set up.